Although it was all North Carolina for the first half hour of the match, all Sam Kerr needs is one chance, and she got just that in the 26th minute. Yuki Nagasato sent in a great through ball to Kerr, and the Aussie rounded new Courage keeper Stephanie Labbe to open up the scoring column for this year’s season. The match opened up after that, but the Courage kept up the pressure, forcing Alyssa Naeher into several fantastic saves. However, you can never count the Courage out. In the 66th minute, Crystal Dunn received the ball from a Jess McDonald throw-in with plenty of space. She took a few touches and launched a shot that seemed to take Naeher and half the Red Stars by surprise. The Red Stars settled back into their own half after the equalizer, seemingly content for the draw, but they actually came the closest to taking all three points when a Kerr shot late in stoppage time somehow hit the underside of the crossbar, rebounded to the goal line, and still didn’t go in. The Courage (0-0-1) host Orlando next Wednesday, while Chicago (0-0-1) has their home opener next Saturday against Portland. 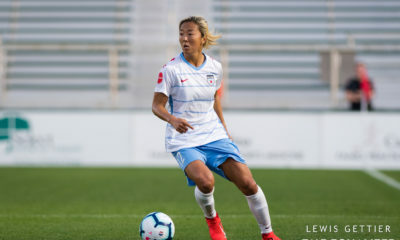 Finishing last season at the bottom of the table, the Washington Spirit and Sky Blue FC realized they have a lot to prove in 2019. At the Maryland SoccerPlex, the Washington Spirit kicked off their season in a high-energy fashion. Spirit head coach Richie Burke lined up rookies Sam Staab, Tegan McGrady and Jordan DiBiasi in the starting lineup. Meanwhile, Sky Blue head coach Denise Reddy also elected to start rookie Julie James in the midfield. However, it was the rookie Staab that scored the opening goal for the Washington Spirit. 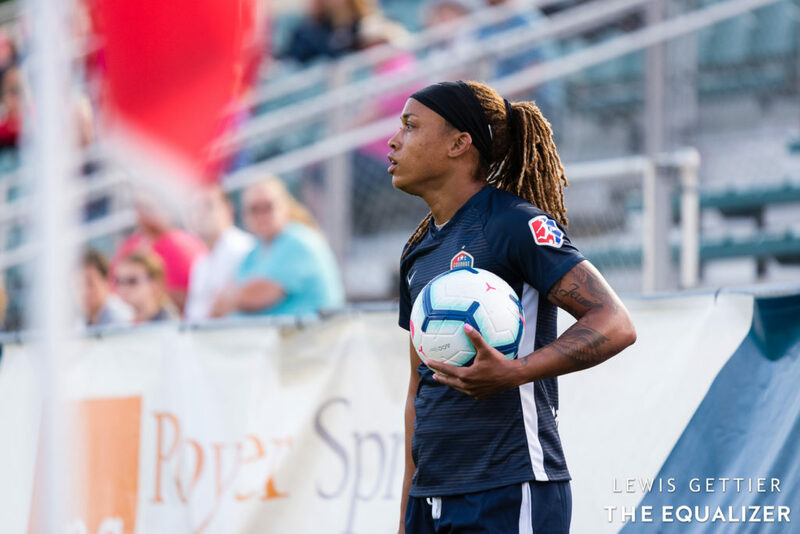 The Spirit weren’t finished, though, with a late second half goal by defender Megan Crosson, who entered the match for Cheyna Matthews — who made her return to NWSL action after missing last season on maternity leave — in the 69th minute. Sky Blue FC had their chances, with Carli Lloyd smacking a shot off the crossbar with her head. Lloyd also had a shot on goal. Meanwhile, rookie Paige Monaghan also recorded a shot on goal. However, were saved by Spirit goalkeeper Aubrey Bledsoe. Up next for the Washington Spirit (1-0-0) is a trip across the United States to face the Utah Royals FC, who haven’t played a match yet. The match will begin at 9 p.m. Meanwhile, Sky Blue FC will host the Houston Dash for their home opener at Yurcak Field in New Jersey at 6 p.m. ET.